We are continuing with our 6 day series highlighting the different Vertical Teams each day on our blog. Please follow along to hear about all of the SEL successes this school year! Join us today as we celebrate Eastside Memorial Vertical Team’s accomplishments. Eastside Memorial High School’s staff has compassion! 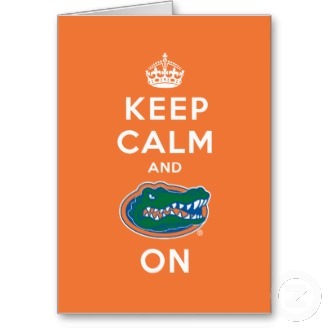 Eastside has created a “culture of calm” – it is becoming cool to be smart and successful! There is a sense of pride and confidence, and students here take the time to help each other with both personal and academic concerns. SEL is woven into Advisory lessons, school-wide expectations for students, and character education lessons in athletics. Next year’s focus: Consistency and depth. Martin Middle School is all about relationship building; from the Principal high fiving students in the hall to teachers using positive language to redirect misbehaviors. Here’s an example of one way Martin encourages relationships: teachers share personal information about themselves outside of their rooms to encourage a deeper connection between staff and students. Allison Elementary was one of the first schools to pilot SEL campus wide. This year, they have been focused on encouraging a positive culture and climate to reinforce the explicit instruction in the classroom. The Principal, Mr. Velasquez, at Allison Elementary likes to start off morning assemblies with jokes, often submitted by students. This practice builds language arts skills as well as contributing to the positive culture and climate at Allison! Allison is also excelling at integrating SEL concepts into core academic areas. Here’s an example of SEL Standard Goal IV Objective A: “uses positive communication and social skills to interact effectively with others,” integrated into ELA. Blackshear Elementary does a wonderful job integrating SEL skills into other subject areas. Here’s an example of empathy skills and feeling identification integrated into a second grade English Language Arts lesson! 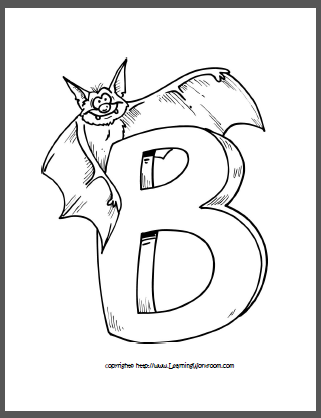 Brooke Elementary integrated SEL language into their campus wide behavior management plan so that students are practicing problem solving skills to better learn how to prevent behavior issues. Govalle Elementary has been encouraging adults to model SEL skills as their students learn them. Check out their hallway expectations that include a column for adults. The Parent Support Specialist also took parents into classrooms for them to view peace areas. Many parents have already created their own peace areas at home! Metz Elementary did so many awesome campus wide events this year. For No Place for Hate, Metz students lead a peace walk to Zavala Elementary to build new relationships and respect for others. Metz also does an SEL focused morning assembly every Thursday where students act out skits, sing Second Step songs, and celebrate their SEL skills. Ortega Elementary knows how to build community and welcome new students and staff! Over the summer, teachers developed activities for the first 30 days of school to encourage team building in their classrooms as students coming from several different schools all came together at Ortega. They already have a plan for having student welcome ambassadors to help new students transition in to this caring school. Kindergarten teachers at Ortega sharing SEL strategies for waiting during a morning assembly. Zavala Elementary’s peace areas have really taken off (their Principal, Mr. Fox, created one for his office as well)! One third grade teacher made her own Zen Garden for students to use in the peace area. She took a small Tupperware container and added sand, marbles, and a fork. Genius! At the end of the year, the SEL steering committee celebrated staff for their different SEL skills they modeled during the year. What a wonderful way to end their first year as an SEL campus! Let’s wrap up today’s post with a note of appreciation written by a student at Eastside Memorial. Our next feature highlights the amazing work of our pilot SEL schools and the Athletic Department. So, without further ado read on to learn about their amazing progress! Andrews Elementary: During a Parent Coffee at Andrews this year, the parents were very interested in the Peace Path process as a process they could use in the home with their children. After seeing the process modeled at the parent coffee, the Andrews Parent Support Specialist received a request from 20 parents for the Peace Path template! Casey Elementary developed it’s very own calm down song and dance! Those Casey Crocodiles really know their Croc Rock! Teachers at Casey also take turns leading the SEL morning assembly each Tuesday that reinforced their Monday morning Second Step lessons. 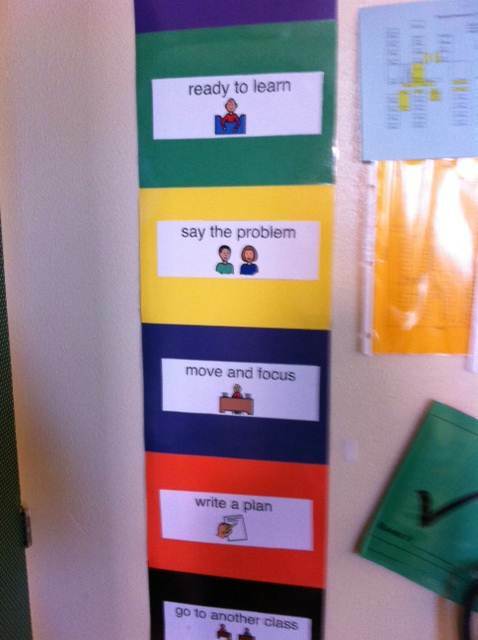 Perez Elementary has structured their Second Step lessons so that all staff participates in a lesson. Cafeteria staff, office staff, special area teachers, etc. all join a classroom to help with the lesson. 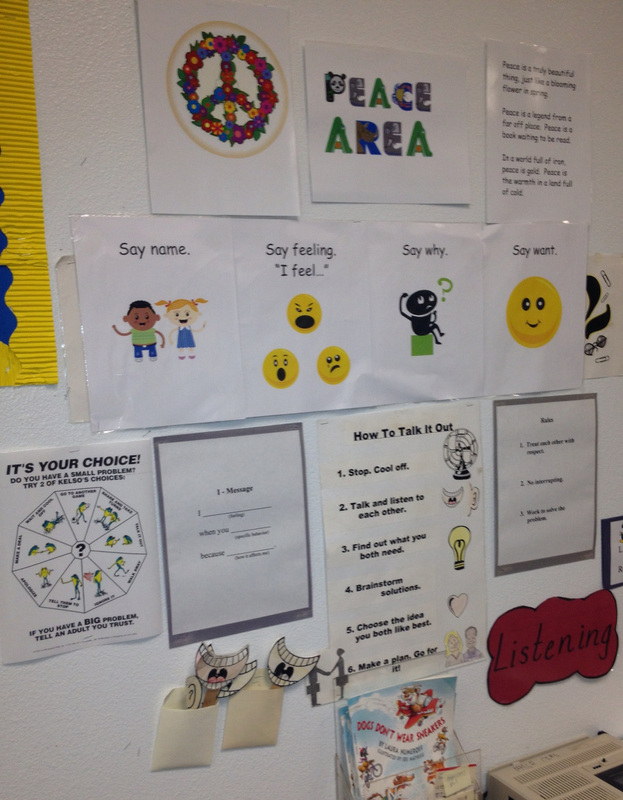 They also each have a mini Calming Down poster and a Problem Solving poster to wear with their badges. 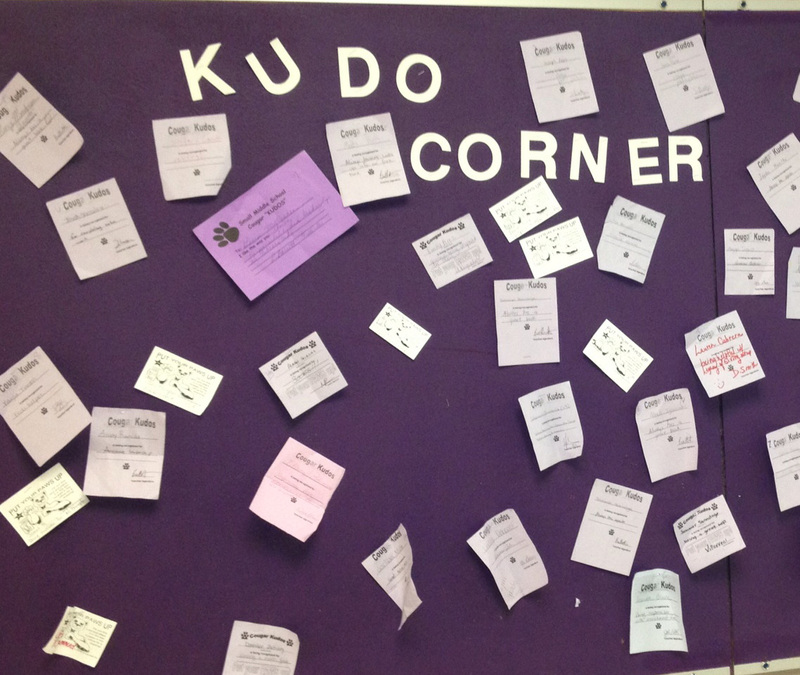 What a wonderful way to build a common language and skill base across campus! This year AISD Athletics, AISD Department of Social and Emotional Learning and SafePlace entered a collaborative project to enhance character education within AISD athletics. Each month four 30 minute lessons are written and sent to each of the high school athletic directors to be distributed to head coaches in every sport. Coaches are trained by staff at athletic director meetings each month on how to use the lessons. Coaches use the lessons, enhanced by their words and personal stories to best teach the topics to the student athletes. Each school is also sent bulletin board materials created by Safe Place and designed to match the topic. This project has reached over 10,000 athletes and will be expanded to both middle school athletics and high school band programs next year. Moments of greatness awards were given to athletes that personified some of the character lessons throughout the year in public settings. This year’s highlights were great lessons on sportsmanship, teamwork, decision-making, drug prevention, and priorities. One lesson on respect culminated in entire teams of athletes signing the resolution of respect after a rich discussion. The most recent lesson on relationships and abuse was a very strong attempt to reduce violence against women by using the influence of coaches to teach respectful / healthy dating and relationships. For the next week and a half we will be highlighting different campuses each day on our blog. Please follow along to hear about all of their SEL successes this school year! Join us today as we celebrate Austin High Vertical Team’s accomplishments. Be sure to share comments, ideas, and questions with us below! Austin High School: Austin High has been implementing a pilot class called MAPS: Methods for Academic and Personal Success to teach social and emotional learning skills to incoming Freshmen. The three year data continues to show remarkable improvement. The freshman class at Austin High School has had a 41% decrease in number of failures and a 38% decrease in the number of disciplinary referrals. We can’t show causality, but we believe the data does show correlation. 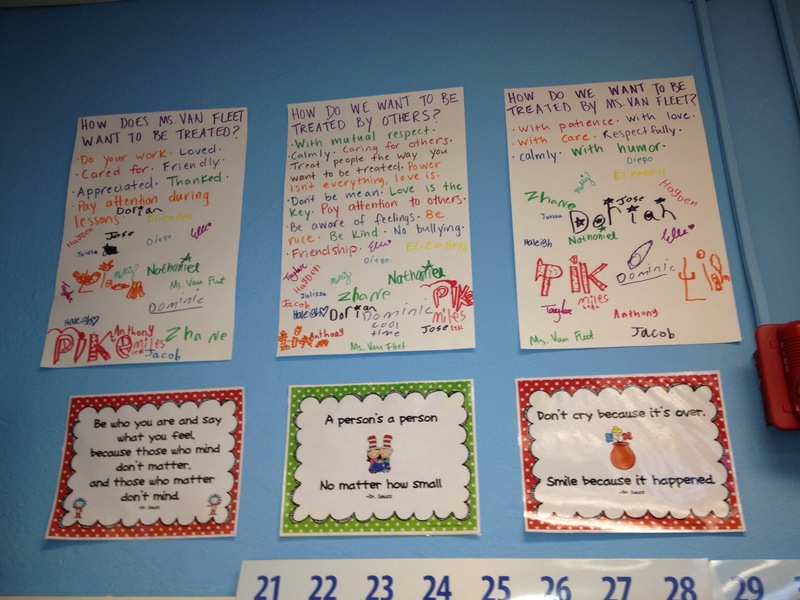 Students have built a strong classroom environment and learned many SEL skills over the course of the year. There have been many special events including: a student panel on SEL for CASEL Learning Event, an etiquette luncheon, and a special field trip to hear one of the freedom writers (Manny Scott) speak. This May, students and families will gather at an area park for a Good News pot luck, where students will share highlights from the year and finish with a positive social event that includes their families. Students are currently completing semester projects where they will present one SEL skill. They will create a lesson, poster, brochure, movie, short story, or song designed to promote positive social and emotional skills among their classmates. O. Henry Middle School: The Second Step resource is being implemented during RODEO (advisory) time weekly. The two SEL facilitators and the principal have been supportive of the teachers and students during this time by making sure that materials are readily available to the teachers and by participating in classroom discussions. Next year, O. Henry will have an elective class that will be devoted entirely to SEL. O. Henry has welcomed many interested visitors this year specifically to look at a successful middle school model for SEL implementation. The principal is very proud of the fact that his referral rates have reduced since O. Henry became an SEL campus. 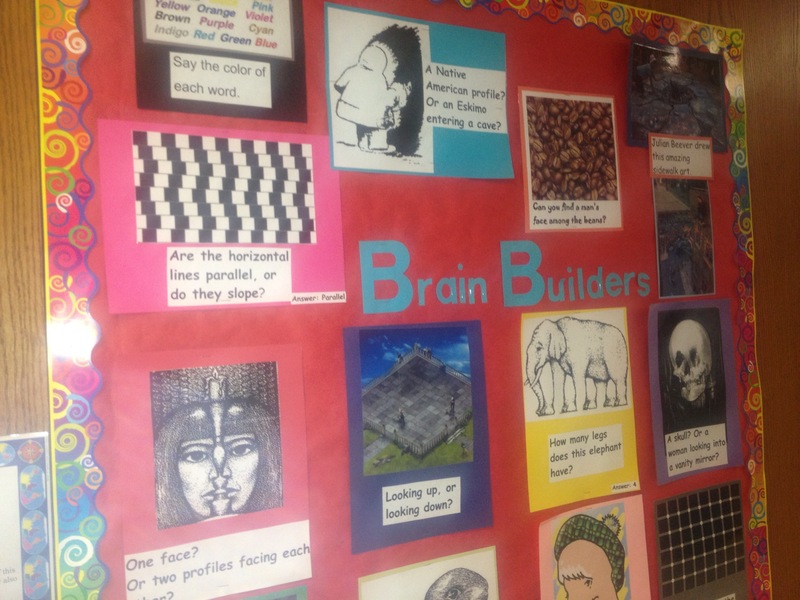 Barton Hills Elementary: The teachers at Barton Hills have done a nice job of structuring supportive and nurturing classrooms that promote student learning and sharing of ideas. They experienced their first SEL Learning Walk this year and were proud of the positive feedback they received. 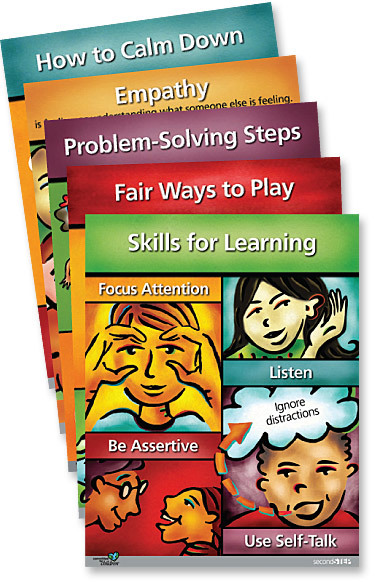 Classrooms are implementing SEL instructional strategies in many of the academic areas. Bryker Woods Elementary: Bryker Woods has done a great job with promoting a positive culture and climate on their campus. 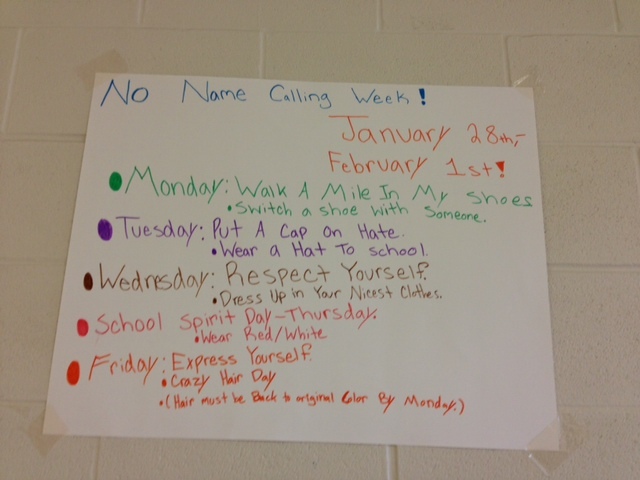 Every grade has participated in classroom and school wide activities that promote SEL. 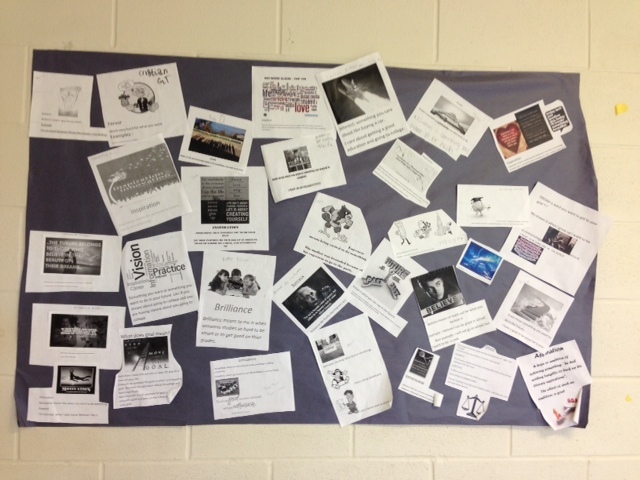 When walking in the halls of their campus you can see many beautiful bulletin boards that display SEL related themes. 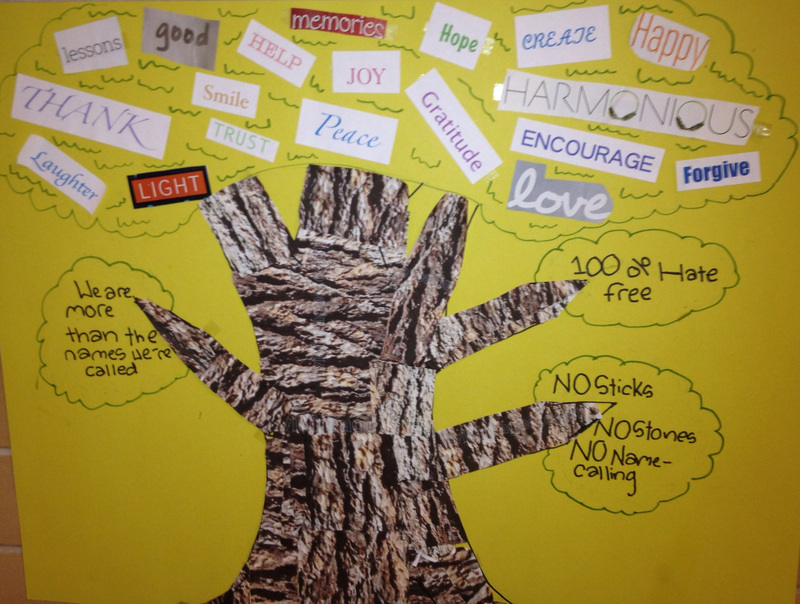 Casis Elementary: Casis students have enjoyed working on their “No Place for Hate” activities this school year, but especially devoted a lot of time and dedication to the “Peace Pedals” project. The culture and climate at Casis is a positive one and can be felt instantly as one enters the building. 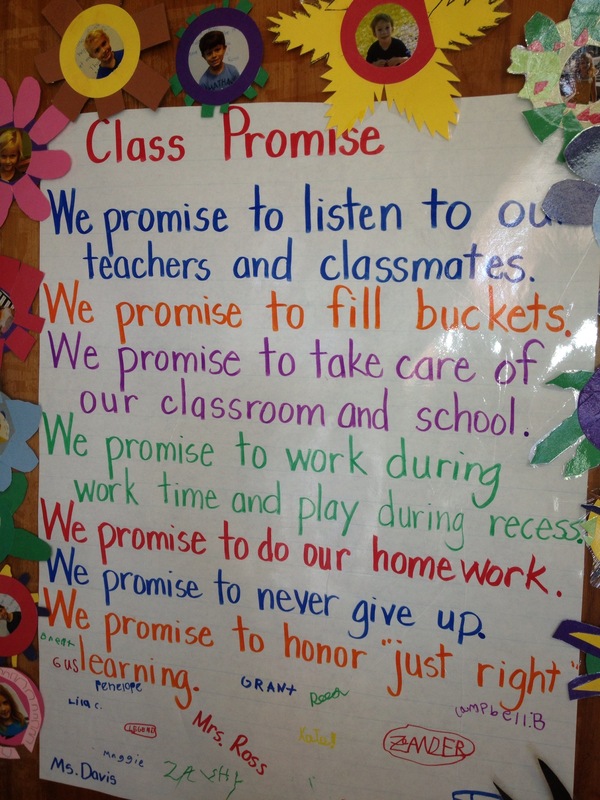 The primary classrooms are especially proud of the class promises they have made to their peers and teachers. Mathews Elementary: Mathews held their SEL assemblies every Friday. Each grade level was responsible for a mini presentation that reinforced an SEL skill or concept. These assemblies also allowed for the appreciation of cultural diversity and for celebrations of staff and student accomplishments. Pease Elementary: Pease Elementary scheduled monthly faculty meetings that focused on SEL related topics. The principal, campus facilitator, and SEL coach met monthly to plan for these meetings. 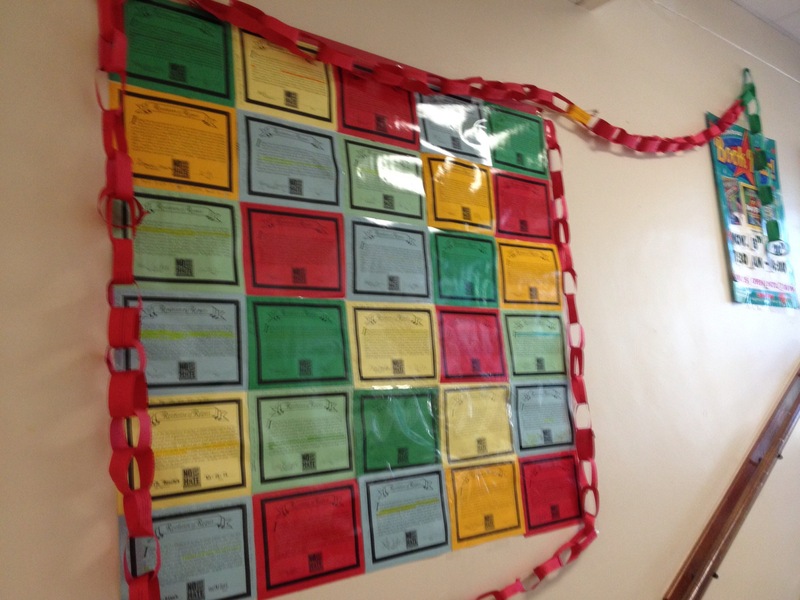 Pease has been proud of keeping their commitments to the staff and class social contracts. 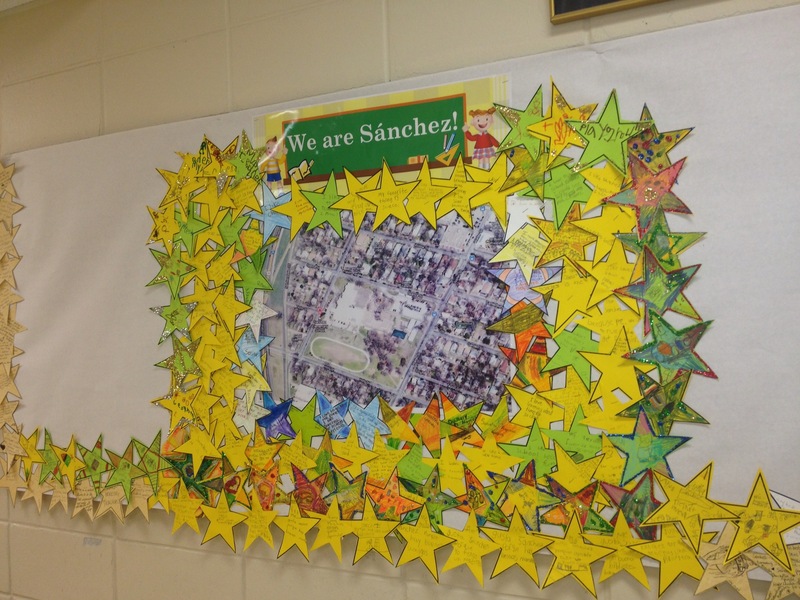 Sanchez Elementary: The students and staff at Sanchez worked very hard this year on their “No Place for Hate” school wide projects. 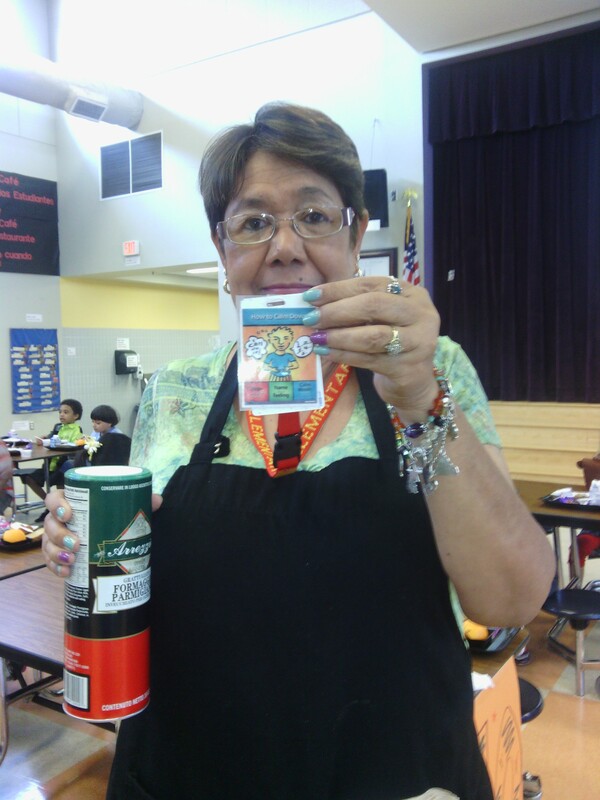 Visiting Sanchez parents eating lunch with their children have been impressed with how the cafeteria monitors have been using the “How to Calm Down” strategies and “Problem Solving Steps” in the cafeteria during lunch time. The large Second Step posters hanging in the cafeteria as well as the mini poster lanyards the monitors have been wearing, have served as good visual reminders for using these strategies. 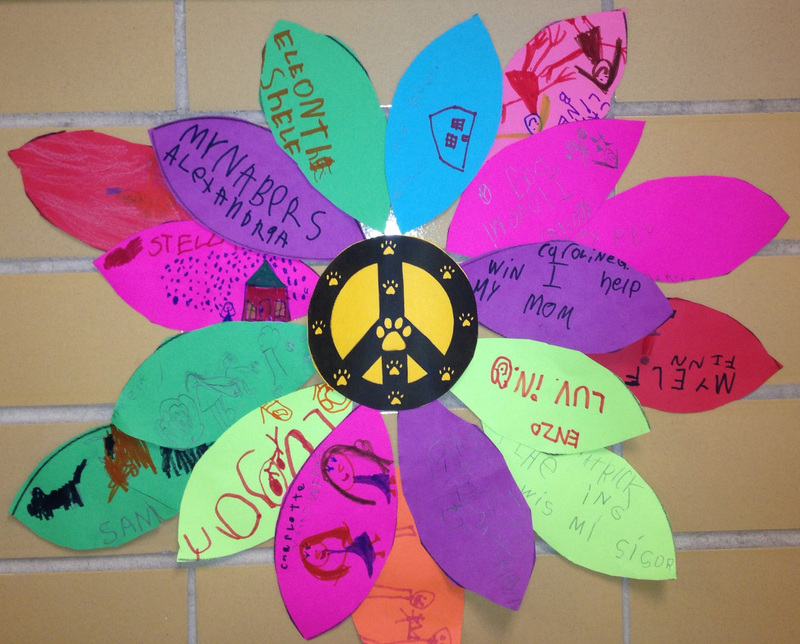 Zilker Elementary: The students in the primary grades at Zilker Elementary have been consistent with their use of the Peace Areas and Peace Paths. The principal reported a drop in the referral rate, which correlates with the implementation of these processes. This year the students in the “No Place for Hate” coalition produced, directed, and edited an SEL infomercial. The video was posted on Vimeo and received many favorable reviews! Small Middle School: Elective teachers from grades 6-8 have been teaching the Second Step resource during TRACK time once a week at Small. Activities that promote a positive school culture and climate have emerged this school year. 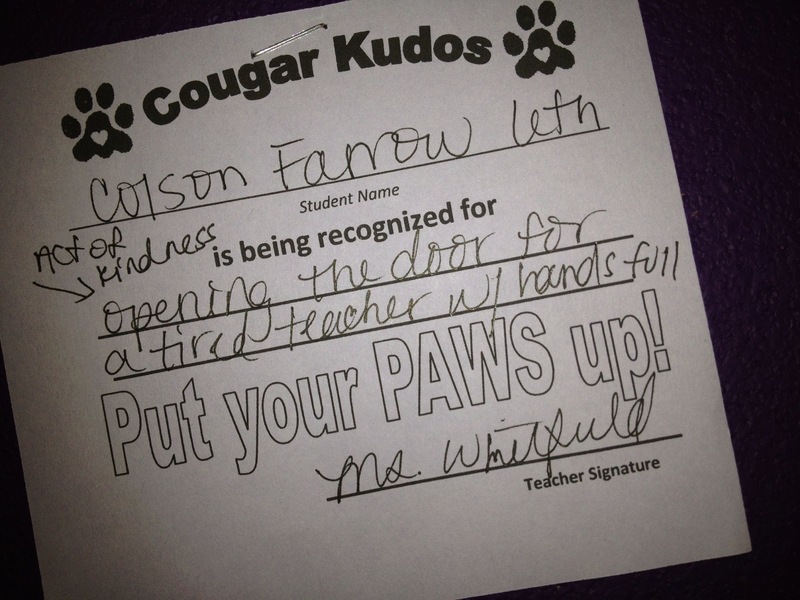 Students have been receiving Cougar Kudos for using SEL skills. This year staff members submitted fellow colleagues’ names in a box in the office for demonstrating exceptional team work and collaboration. During faculty meetings, there were drawings for recognizing these teachers. The teachers whose names were drawn received gift cards! Oak Hill Elementary: Oak Hill has enjoyed celebrating cultural diversity by displaying international flags representing countries from all over the world in their cafeteria. The Oak Hill PTA has organized social gatherings periodically for the school staff, parents, and other members of the community to meet and have international food tastings on the weekends at Oak Hill. More Peace Areas have been seen in classrooms this year! 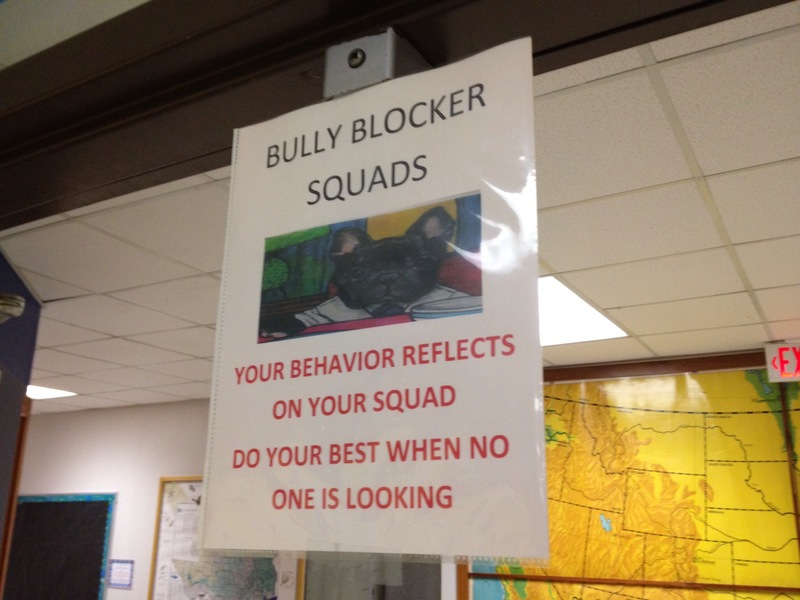 Patton Elementary: Patton has been especially proud of their “Bully Blockers” initiative. Students in grades K-5 sign a pledge to not be bullies and to be allies to those who may be targets. They also receive bracelets after signing the pledge. Squad leaders are selected from each grade level to lead a squad that helps to empower other students that may be experiencing bullying. Each squad can earn points for modeling “ally” behaviors. It’s the end of the school year and many of us are exhausted. This brain builder is an instant energizing, relationship building, feel good, mood lifter! Plus it takes under a minute to do and is easy to adjust for any audience. Have students (or adults) turn to someone sitting next to them and say, “You’re awesome!” then give them a high five. Now watch as the energy of the room takes a dramatic and uplifting turn for the better. Our brain break this week comes from a stress management training by Keeth Matheny. Enjoy!